LOS ALAMITOS, CA - With all eyes turned towards 2019, trend predictions for the new year are beginning to trickle in. 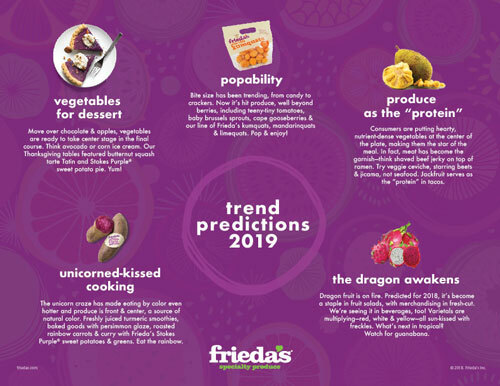 Frieda’s “trendologists” have identified five food trends they believe will take consumers by storm in the next twelve months. “Fads become trends when they resonate with consumers beyond their 15 minutes of fame. We overlay consumer sentiment to predict what will really stick,” according to to Cindy Sherman, Director of Marketing & Innovation, in a recent press release. Coming in at the number five projected trend is the legendary dragonfruit. After becoming a staple in fruit salads and taking merchandising by storm in the fresh-cut sector, dragonfruit is stalking its newest prey in the beverage case. Continual varietal development, which now includes red, white, and yellow, indicates that the dragonfruit’s reign of terror is far from over. Keep an eye out for sightings in 2019. Trend number four witnesses produce taking a seat in an unconventional spot, at the dessert table! With veggie incorporations in treats ranging from ice creams, to tarts, to Freida’s own Stokes Purple® sweet potato pie, this trend is just heating up. Look for new and inventive ways to combine produce and pastries over the next year. Vegetables will take center stage on plates with trend number three, which introduces produce as the star of the meal. Instead of a juicy steak with a side of steamed veggies, think of an earthy portobello burger with a side dish of brussel sprouts and bacon. Other new alternative protein dishes include jackfruit “tacos” and string bean and jicama “ceviche”. More developments on the plant-as-protein front are sure to whet consumers' appetites during the coming months. Natural colors are catching consumers eyes and gluing them to the number two fantastical trend: the unicorn. With turmeric and beets providing vibrant natural hues, the pot-of-gold rainbow carrots landing on plates nationwide, and Freida’s own Stokes Purple® sweet potatoes making a splash, consumers will be heading to the grocery aisles to stock up on produce of every color of the rainbow next year. Taking the number one trend spot are bite-sized eats. Produce has become popable to keep up with this trend, giving rise to baby brussels, tiny tomatoes, and cute kumquats from Frieda’s. 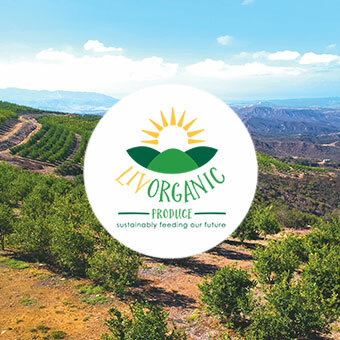 Forecasted to continue through the new year, bite-sized varietals should be on every producers mind as we enter the new year. 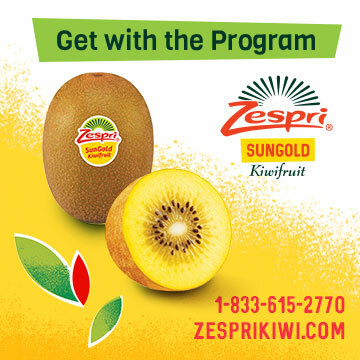 Consumers can’t get enough of on-trend foods, so check AndNowUKnow for more trend predictions and updates for the coming year.